.33 WCF caliber, 24" matted top round barrel, take-down, serial number 151483. "F"-style checkered pistol grip, shotgun buttstock and forearm are of hand-made oil-finished English walnut. The left side of the stock has a "Roosevelt"-style cheek piece outlined by three tiered scrolls. Checkering is very fine, thirty-two lines to the inch. Rifle has a checkered trigger. The left side of the receiver is engraved and inlaid in gold with images of a buck, doe and fawn. The right side is engraved and inlaid in gold with a bull moose and cow. The underside of the receiver, forward of the lever carries a raised gold monogram composed of the letters J.F.D. ca 1.25" in length. Balance of the receiver, lever, barrel at breech, muzzle, forearm tip, top of breech bolt, upper and lower tang, buttplate, screw heads, magazine plug, takedown lever are all highly engraved. Rear sporting sight with untouched "Sheard" medium gold bead front sight. The Winchester Factory letter specifies: One hundred ninety-five grams of gold, $125.00 for engraving by (J. Ulrich), $25.00 for checkering by (C. Ulrich). There has been research done on vintage factory engraved Winchester rifles with $100.00 or more of engraving. 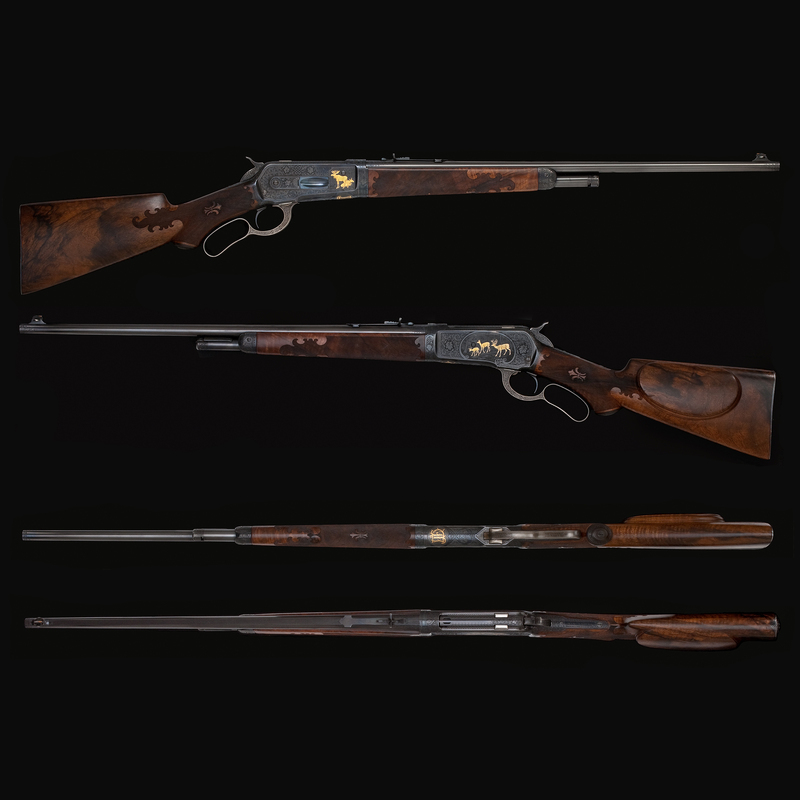 Cowan's Auction researcher found only nine such rifles in the Winchester firearms records. Of the nine, two had more than $100.00 worth of engraving on them. This rifle is one of these two listed in the Winchester factory records. All of this information regarding the work in making the Model 1886 rifle #151483 is detailed in the factory letter from the Cody Museum. This firearm was made exclusively for John F. Dodge, co-founder of the Dodge Automobile Company. The rifle is truly a work of art and a "one of a kind" Winchester Model 1886 rifle. Seldom does a collector find a Winchester factory letter that has details listing all of the unique features of creating a special ordered rifle so thoroughly documented. Furthermore, it is unusual to find a Winchester rifle that has been engraved by one Ulrich and checkering rendered by another Ulrich and properly documented. Barrel, magazine tube and takedown lever retain ca 98% original bright blue finish. Receiver retains ca 97% original blue finish with a small spot on the left side of receiver at the top border around the panel has a very small, minute area of loss of finish, otherwise the frame does retain ca 99%. Lever retains ca 98% of its case coloring, but thinning. Buttstock and forearm retain all of their original oil finish with a few storage nicks, but does not distract from the beauty of the rifle. This rifle has never been seen by firearms collectors or photographed for the public until now. It is without a doubt the finest gold inlaid and special order Winchester Model 1886 rifle ever to be offered for public sale.